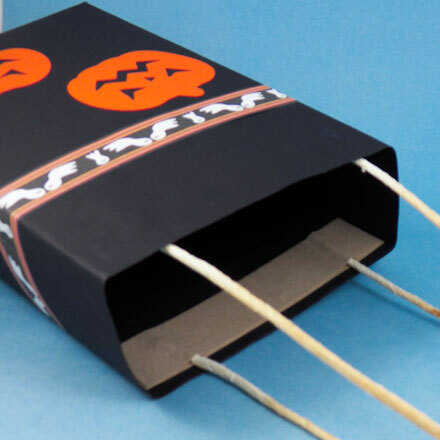 It's quick and easy to make Halloween-decorated trick or treat bags in any size! 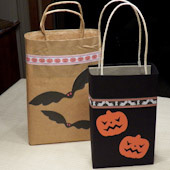 Make large bags with handles to collect your treats as you go from door to door. Make small bags for Halloween party goodies or to hand out to the trick-or-treaters who come to your door. Make your own Halloween paper cuts to decorate the bags, or use Aunt Annie's printable patterns below. Related craft: You can make two bags for packaging treats from a single sheet of paper! See how to make them in Aunt Annie's Halloween Treat Bags craft project. This project includes Halloween-themed digital papers to download. Take a book or a stack of books about the size of the bag you want to make. You may need to make two or more stacks of books side-by-side for a large bag. A paperback book or two will work fine for a small treat bag. This stack of books will be used as a form to create the bag. You can also use a box or a stack of boxes as a form. Tip: One or two thick telephone books work well for a large bag. To make a bag from a single sheet of 12" by 18" construction paper, two or three trade-size paperback books work well. Cut a sheet of brown craft paper or wrapping paper to use in making the bag. In one direction, the paper should be the desired height of the bag plus 2" to 4", depending on the size of the bag. In other words, the paper should be the height of the bag plus enough paper to fold over the end of the stack of books, plus 1". In the other direction, the paper should wrap around the stack of books, with ½" extra (1 cm) for overlap. Tip: If you are using a sheet of 12" by 18" construction paper to make your bag, it does not need to be cut. Place the wrapping paper right side-down. Fold back 1" (2 cm) along the top edge, crease, and glue in place. Tip: Do not fold the top edge of construction paper. Instead, cut a 1" to 2" by 18" strip of construction paper to reinforce the top edge. Glue it in place. With the paper right side-down, place the stack of books in the center near the bottom edge. Be sure that the stack sits above the bottom edge by about 3/4 of the stack's height. Wrap the paper around the stack and secure the seam with glue or double-sided tape. Be sure that the top edge meets evenly at the seam. Tip: Be careful not to wrap too tightly, or it will be difficult to remove the stack of books from the bag. Make the bag's base by folding the paper over one end of the stack of books like you are wrapping a box. Run your fingers down each edge of the stack to crease the bag's corners. Tape or glue the folded paper in place. A secure hold is important! Remove the stack of books from the bag. Tip: Construction paper can be brittle, so it is best not to fold a gusset in a bag made of construction paper. 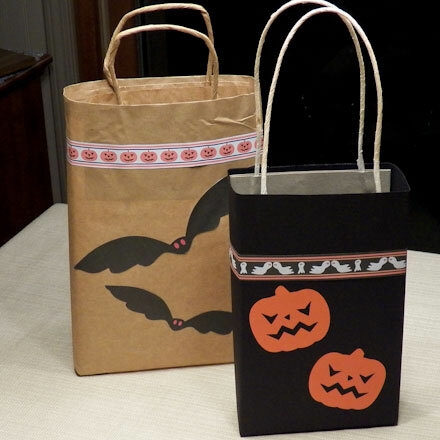 Decorate bags made of plain paper with Halloween cutouts. Print the colored patterns on white paper, then cut and glue. Or print the black & white patterns on cardstock to use as templates, and trace them onto colored construction paper or craft paper. Tip: Checkout the Halloween paper ribbons in the Halloween Cone Hats project for quick and colorful bag decorations. Make the bag stronger by reinforcing the bottom with a piece of cardboard cut to size and placed in the bottom of the bag. Glue it in the bottom of the bag for the most strength! 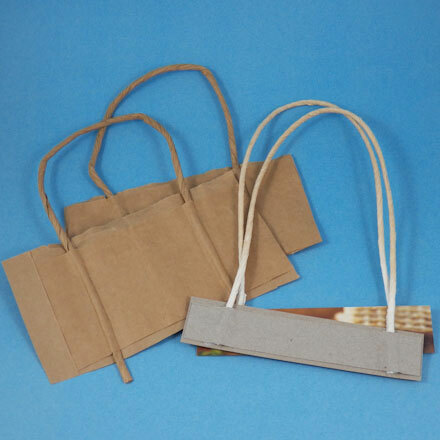 Add handles made of stiff twine or cord to a large bag: Cut four pieces of cardboard the width of the bag by 1" to 2" (2 to 4 cm) high. Cut two lengths of stiff twine or cord to the desired size for the handles. Bend the twine into handle shapes and glue each one between two pieces of cardboard. After the glue has dried, glue the handles inside of the bag—one on each side. 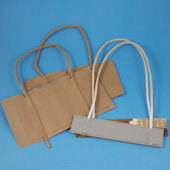 Use a good quality craft glue for a strong hold, or staple the twine and cardboard in place for added strength. That's it! Your bag is complete! Tip: Recycle the handles from old bags and glue them inside your trick or treat bag. Tip: Glue the twine handles between two strips of cardboard and glue inside the trick or treat bag. This bag was made of a single sheet of 12" by 18" construction paper wrapped over two trade-size paperback books. 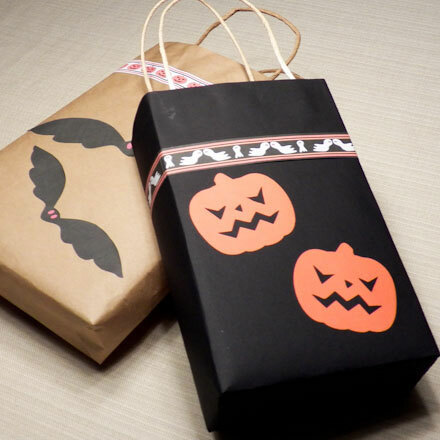 Tip: Decorate plain paper bags with Halloween-themed paper cutouts—see Step 8 for patterns. You can also decorate the bags with the Halloween paper ribbons in the Halloween Cone Hats project.